“Deadpool 2” stars Ryan Reynolds as the titular character in another R-rated, comic book, action comedy that has some high expectations to live up to after the success of its predecessor. From the opening scenes it becomes clear that director David Leitch’s and Reynolds’ plan for part two was to pile on more of what everyone loved the first time around: more action, more jokes, more cameos and more fourth wall breaking references. The soundtrack also plays a bigger role in this movie, so make sure you’re paying attention to the music in big moments to catch jokes that a lot of the audience may never pick up on. The cast is bigger this time around, too, with Josh Brolin coming on to play the time-traveling, cyborg solider Cable, Zazie Beetz joining the team as Domino and Julian Dennison playing a kid named Russell. Russell is arguably an even bigger part of the film than Cable is and serves as Deadpool’s motivation for most of the film. Cable and Domino are both pretty much absent for the entire first act, but that gives us a chance to get re-acquainted with the characters we liked from part one. Deadpool’s cab driver Dopinder, played by Karan Soni, is surprisingly funny and gets more screen time. 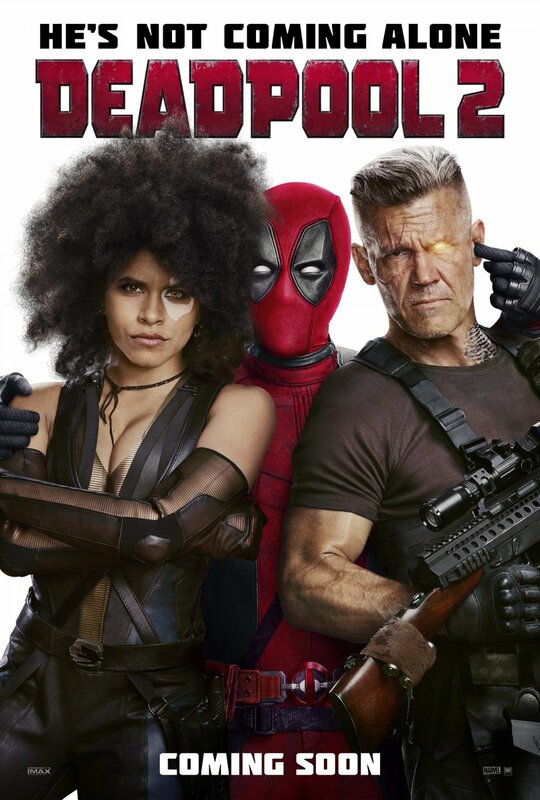 T.J. Miller and Leslie Uggams are both back as Weasel and Blind Al, respectively, and they both get moments to shine despite all the comic book craziness happening with Cable, Domino and Deadpool. Morena Baccarin is back as Deadpool’s fiancé Vanessa and once again she has great on-screen chemistry with Reynolds’ Wade Wilson. Their relationship was the foundation of the original film and they continue to build off of it in the sequel. The most important thing about their romance is that they use it to somehow make Deadpool endearing. The action is a step up from part one but there are definitely still some sketchy CGI moments, and even though the movie points out its own special effects, it doesn’t mean they aren’t still a little off. The comedy is still great if you’re well-versed in the comic book movie industry, but there are so many jokes coming from so many places about so many properties that your enjoyment of the movie is almost entirely based on your pre-existing knowledge about comic books or comic book movies. Bottom line, if you liked the first Deadpool movie, “Deadpool 2” is more of everything the first had to offer. The sequel is every bit as funny as the first, maybe more so, but the original does have a much more focused story. While there is definitely some heart to “Deadpool 2,” it feels like the emotional heavy lifting was done in part one, and part two is all about the fun, especially in what will be talked about as possibly the best mid-credits scene we’ve ever seen. Make sure you stick around in the theater for a few extra minutes when the movie ends.